Chris Townsend is something of a hero to me. When I was first looking to undertake multi-day backpacking trips more than 20 years ago, it was Chris’s book, The Backpacker’s Handbook that I referred to for information and advice. I’ve followed his work and his exploits ever since. 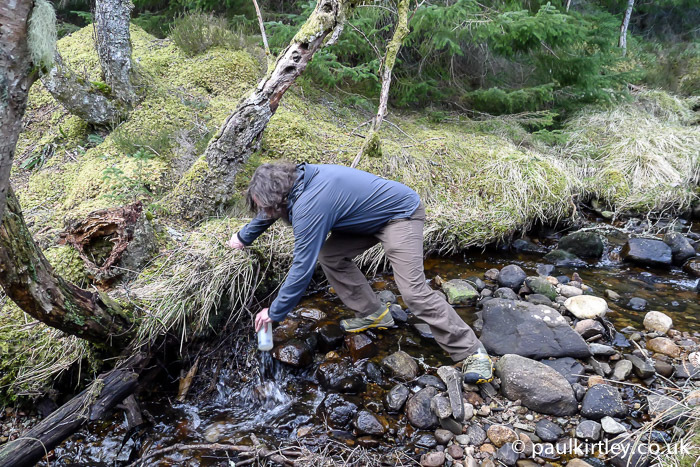 Chris has a huge depth and breadth of long distance walking experience – both on trail and off trail – and his advice and opinions are always practical and pragmatic. 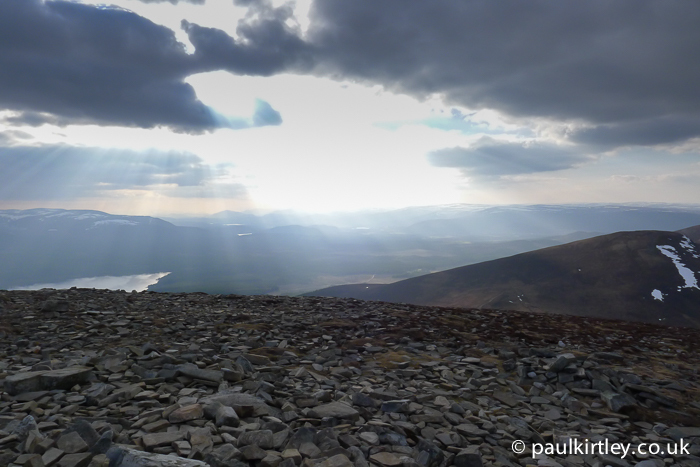 It was a real delight to spend the day walking with Chris in the Cairngorms near to where he lives in the Scottish Highlands. 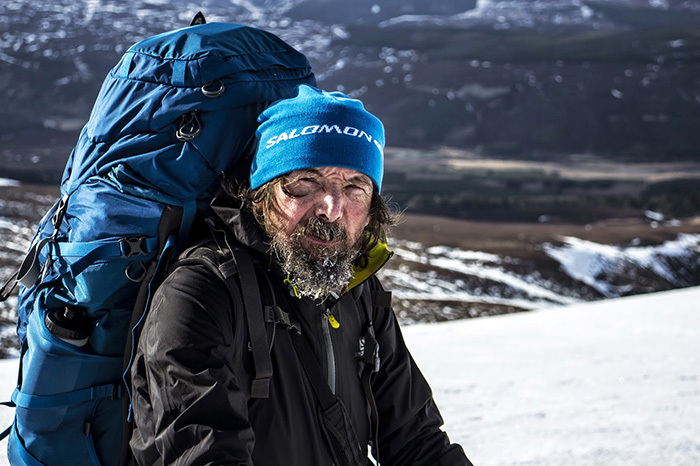 We talked about wilderness journeys, wild places, gear, best practice and photography. There’s a tonne of advice and perspective in this podcast for both the novice backpacker as well as the seasoned trail hiker. 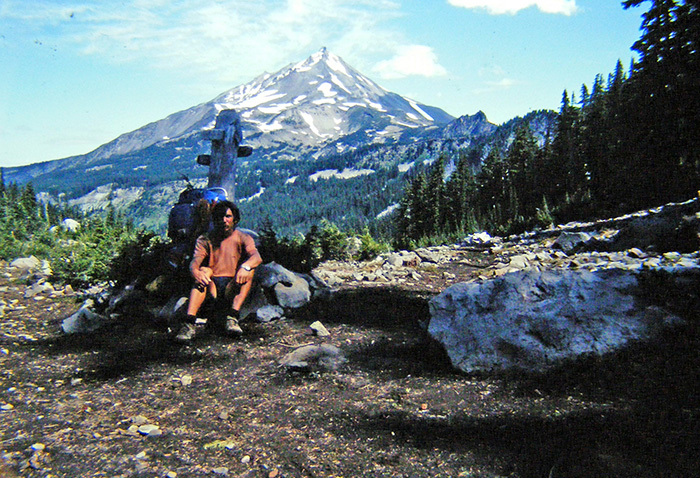 Chris Townsend camping on the Pacific North West Trail. Click here to read or download the transcript of Paul Kirtley Podcast 008. 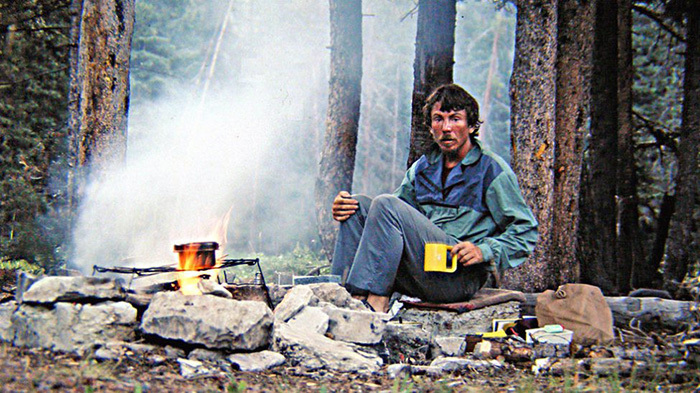 Chris Townsend on the Pacific Crest Trail 1982. 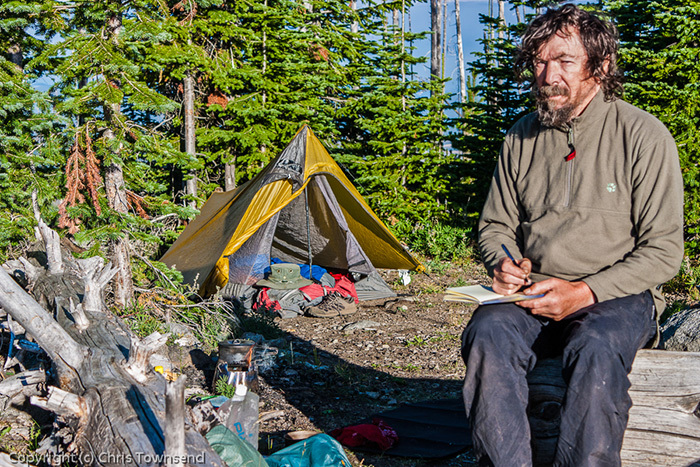 Chris Townsend by the campfire on his trek of the Continental Divide Trail. Fantabulous! Big fan of Chris! Great podcast. Really cool to listen to Chris talking. I just bought the Backpacker’s handbook, really helpful. I read the Backpackers Handbook many years ago. Time to revisit I think. Excellent podcast, as always. This one with a true legend. Thank you both. Thanks for all your mails. Chris mentioned a petrol stove that he favoured in your Podcast. Is there a link to this or could one be provide. I haven’t finished the podcast yet but how fascinating is his experiences, opinions and thoughts. I was curious…so I listened…was impressed by the passion, the insight, …. I think that’s why some are chosen to experience n write….deep philosophy, insights…along with practical wisdom…hand me down to next generation…so that knowledge is passed on. And was amazed to see the philosophy of his opening pages….it’s an amazing read…awesome experiencing nature through someone who’s known her well….and for all my excuses for it being cold…and not sleeping overnight …I might yet learn to trust nature through her rhythms to keep me warm. Awesome podcast . Thanks Paul! Absolutely loved this podcast, Chris is an amazing bloke to listen to. It is a shame you didn’t have days to talk to him would have love to hear more of what he has to say. Thanks to both of you for putting this together for us, great work Paul, as always. Great podcast Paul/Chris. It was so interesting that I listen to it twice already and I’ll probably listen to it another two times again. I’ve never heard of Chris before, which now having gained a bit of knowledge about him I’m really surprised that I haven’t. I’ll definitely be looking into his exploits, as his journey are so inspirational! Keep up the great work a Paul. I don’t know how you find the time to do it all? Do you ever sleep? I’ve really enjoyed all eight podcasts! This one was really interesting for me because I’m currently hiking and wild camping a lot in practice for hiking / camping the 270 mile Kungsleden trail in northern Sweden this summer! It really was a fascinating podcast listening and learning from Chris’s knowledge and experiences! The Pacific Crest Trail sounds like an incredable experience I’d love to also hike in the future 🙂 I can’t wait for your next podcast Paul….. Please keep up the great work and I’m also enjoying learning more of the camping etiquette that is a common theme in your interviews! Carols comment made me smile…yes, we too get cold , at night. I ended up double bagging the sleeping bag ( 2 bags in one) , double layering the mats, or using a air inflatable one for insulation between ground and me…for a cold and wet night. An ex -military bag helped….but this is heavy! I gave up…and camp out when it’s dry and warm, and when cold….take resort in the vehicle. My little one loves outdoors…yet come nighttime…after the evening fire n meal….comes the puppy eyed look…can we go back to vehicle to ke ep warm….the article. 4 horsemen flashes by….I think hypothermia and cave in…. Any pointers on being snug as a bug, warm…sleeping outside, and keeping it lightweight would be welcome. ..from a those who get very cold very fast point of view! The above comment was for the podcast….lightening the load. By the way: Colin Fletcher (mentioned) was really ahead of his time in terms of using Trekking poles, when hiking in the 1960s. You can even see him with his pretty long walking stick on some of the book covers! Thanks for your feedback Lars. I’m glad you enjoyed this podcast in particular. Very interesting conversation with Chris Townsend. Always enjoy hearing from the more experienced. PK and CT together! Can’t get any better. Although you are both far younger than me, I have probably learned most from you two. I always test what I have learned from experience and other teachers against the views of both of you. Thanks for your comments Jack. I’m very glad to have introduced you to Chris’s books. His Backpacker’s Handbook was very influential on me during my formative backpacking years. I hope you find it as useful as I did. Thanks for the feedback on the podcasts – it’s good to know people are finding them valuable. Joining the BMA as a result.